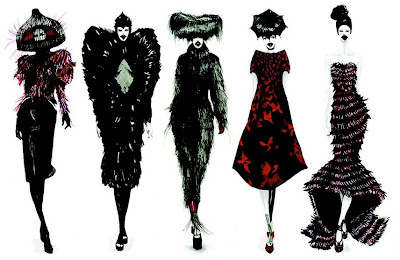 It's been about a week since the sudden and tragic death of British designer Alexander McQueen. I think the world... fashion and beyond... is still recovering. I'm still shock, but in light of the loss of such brilliance and imagination, we were fortunate enough to experience even a passing glimpse of his otherworldly creativity. Even viewed through my feeble rods and cones spying such inspiration from just a computer screen, it still left me breathless. We should also be comforted in his legacy. My cousin Connie Lim (yeah, my family isn't too creative in the name dept. ), who will be studying design at McQueen's alma mater Central St. Martins in the fall, is immensely inspired by McQueen's work, as is evidence by her artistic re-imagining of McQueen's Fall 2009 collection and is proof of the lasting effect genius can have on others. I'm really proud of her and her work, which has been featured in Cyana Trendland and Dazed Digital. This is probably my 45684513787129th attempt at starting a blog to share what inspires me, and my take on everything from fashion to food to music to art to books to culture to fashion again because let's face it, that's the most fun part—all from the little corner of the world that I inhabit. Hopefully, this is will mostly serve as an exercise in my writing and fledgling photography. A great transition has emboldened me to throw my hat in the proverbial ring, and I hope you friends, enemies, strangers and would-be friends out there will come along on this journey with me. THIS BLOG IS NOT AFFILIATED WITH ANY OF THE AFOREMENTIONED COMPANIES AND BRANDS AND NO COPYRIGHT INFRINGEMENT IS INTENDED NOR IMPLIED. ALL PHOTOS AND VIDEOS ARE USED ONLY FOR EDITORIAL COMMENTARY AND NOT FOR COMMERCIAL PURPOSES UNLESS SPECIFIED.